(WEBPUBLICA) NEW YORK - A Christchurch vigil to shun racism and grieve for 50 Muslims killed last week in local mosques drew 15,000 people. One of the victims who was injured in the shooting said the vigil showed “that we are all one,” DW (Deutsche Welle) reported. 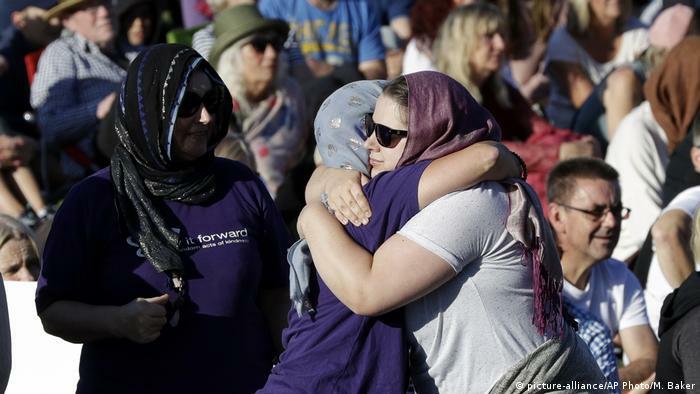 New Zealanders continued their homage Sunday to victims of the Christchurch massacre by gathering in the city’s Hagley Park near the al-Noor mosque, one of two places of worship targeted by a suspected white supremacist. Many non-Muslim women wore head scarves Sunday, some made by members of Christchurch’s Muslim community, to support victims and fight racism, Reuters reported. A similar rally shunning racism while endorsing diversity took place in central Auckland, with participants carrying placards saying “Migrant lives matter” and “Refugees welcome here.” The rallies came in the wake of Friday’s nationwide moment of silence. New Zealand statistics suggest that around one percent of New Zealand’s 4.9 million residents could be Muslim. Christchurch’s Linwood mosque, the second attacked on March 15, re-opened Sunday. Hasty work, also done at the al-Noor mosque, to repair bullet holes and remove bloodstains was evident. On Friday, the city had also seen the burials of 26 victims at its Memori Park Cemetery. The 28-year-old Australian citizen suspected of carrying out the attacks is due to appear in court on April 5 to face an initial murder charge. More are expected to follow. Sunday’s evening vigil at Hagley Park began with an Islamic prayer, followed by a reading of the names of those killed at Friday prayers on March 15, among them present and former pupils of Christchurch high schools. Present in a wheelchair was 21-year-old Mustafa Boztas, who said he was recovering well from bullet wounds in the leg and liver. “It’s beautiful to see what the community has put together to show they care about us, and to show that we are all one,” said Boztas. Sam Brosnaham, student president at the city’s Canterbury University, urged New Zealanders to express openness to persons who “do not look like you, do not talk like you, or express faith in the same way you do,” reported New Zealand’s Fairfax media website known as Stuff. It also quoted a Muslim students’ association spokesman who said the outpouring of grief was “reassuring for us Muslims here who want to contribute to New Zealand society,” but added that Islamophobic remarks still needed to be challenged. Catholic bishop Paul Martin said there had been a “misuse and abuse” of God’s gift of freedom. “We are many faiths brought together by tragedy,” Martin said. The vigil ended with a rendition of “Welcome Home,” a diversity-appeal song heard often in recent days, performed at Hagley by Conor Moore — composed in 2005 by New Zealand’s legendary singer-song-writer Dave Dobbyn. It would show that “”New Zealanders are compassionate, inclusive and diverse, and that we will protect those values” and would be jointly led by the government, the city, local Ngāi Tahu Maori and the Muslim community, she said.